This is a pic of part of the gardens at the Veterans Centre at the Sunnybrook Health Sciences Centre. The average age of our vets is up in the 90s and most of them use wheelchairs to get around so all of the pathways are nicely paved. 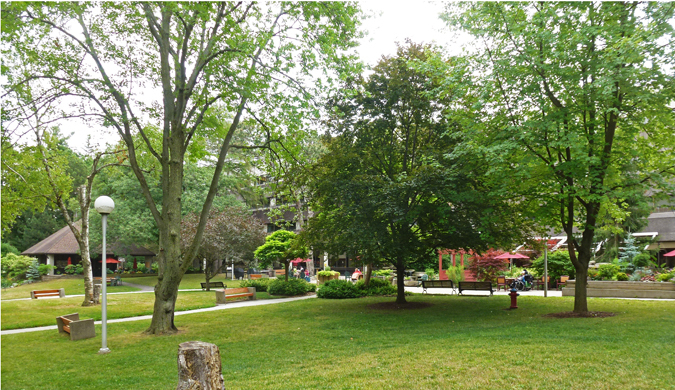 It is a lovely area with many places for families to gather for picnics or barbeques or just for relaxing. ...gardens are good for the soul. That really is a beautiful garden and very befitting of those who have served their country. Hello, it is a wonderful garden and green space. The paths are nice for the veterans in wheelchairs. Enjoy your day and weekend! Very nice garden, Pat ! I know they will enjoy that garden. My grandpa is in a home for veterans in Calgary, he is 96, and enjoys the garden when he feels up to going outside. The garden is pretty and a peaceful place for the vets to enjoy. I would think they enjoy the hearing the sounds of the birds talking and singing to each other. And still very green. Nice. A beautiful place for relaxing, people watching too I bet, and just taking in nature!